Following the publication of the PISA results yesterday (you can see Scotland’s summary here) the OECD has published a number of videos giving an insight into the education systems of the top performers. We’re hearing a lot about education in Finland these days, but few of us have been there to see for ourselves which is why I thought it was worth sharing this video. 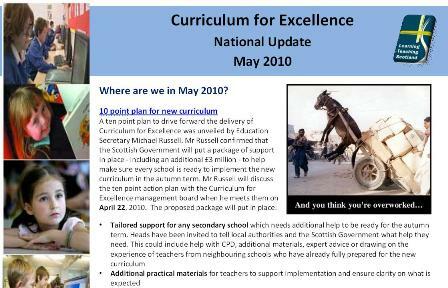 The Scottish Government has produced a series of videos demonstrating the practical application of Curriculum for Excellence to learning and teaching. Are you a bit daunted by the vast amounts of information now available on the LTS website? Have a look at the video above which aims to help you through the support available on the site. Shirley Lawson captured the footage above at a Curriculum for Excellence workshop at a recent Parent Council evening. Thanks Shirley, and thanks again for sharing Gullane Primary School!